School and Classroom Culture: The framework enables school leaders to build a school culture that is mission-driven, welcoming, and integrates academic outcomes. Establishing Purpose: The framework establishes intentional planning for designing instruction that provides students with a clear understanding of what they will know after the instruction, what specific skill they will learn, and how the lesson relates to other learning. Gradual Release of Responsibility: Teachers and instructional leaders will use the framework to learn how to intentionally design, deliver, and scaffold guided instructional practices that maximize student collaborative and independent learning. Formative and Summative Assessments: The framework also assists educators by offering descriptive and actionable feedback while using classroom data to inform targeted future instruction. 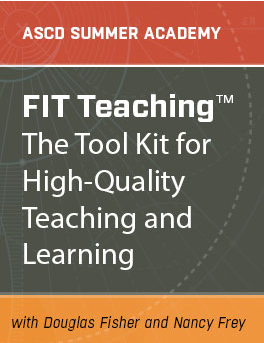 In the webinar, Fisher and Frey will introduce these elements and then take a closer look at the connection between FIT Teaching and teacher evaluation frameworks in order to create a meaningful path forward. Note: A professional development certificate will not be provided for this webinar. Take your learning further and join Fisher and Frey for a three-day intensive academy July 31–August 2, 2014, in Chicago, Ill., that will help you implement high-quality teaching and learning in your school or district. The ASCD Summer Academy is based on the FIT Teaching tool kit, composed of the works of Fisher and Frey. Learn more and register. Douglas Fisher is professor of language and literacy education in the School of Teacher Education at San Diego State University and a classroom teacher at Health Sciences High & Middle College. Nancy Frey is a professor of literacy in the School of Teacher Education at San Diego State University. Before joining the university faculty, she was a special education teacher at Broward County Public Schools in Florida, where she taught elementary and middle school students.